This is an incredible family experience located in the Southeast part of Colorado. Rainbow Trout Ranch has been lovingly-owned and cared for by a couple who fell in love themselves on a ranch in Montana! Jane is from Kenya, but now calls Rainbow Trout home, with husband David, and their children, and has done so for more than 25 years. There are 16 log cabins onsite, all that have fire places, and that can sleep anywhere from one to eight people. 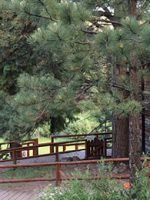 The ranch is nestled on 600 acres and surrounded by National Forest. And, for fishers from novice to expert, the Ranch owns 1.5 miles of a private stretch on the Conejos River that is precious and ripe for nabbing supreme size trout. Activities are endless at the ranch. From river activities to horseback riding, this ranch has a very strong reputation for excellent programming. Their returning family numbers represents the inclusiveness and extremely special nature the owners take in tailoring programs for families. A major perk in the Ranch’s week-long programming is a white-water rafting trip, included in the price, which is rare. There’s so much to do, you would need three weeks to get it all done. Onsite there is a pool and hot tub, evening activities such as BBQ by the river, dancing, talent shows, afternoons rodeos, campfire and S’mores, and much more. What you will not find at this ranch is TV, DVD, much wireless coverage or much other technology. The focus is the outdoors, the expansive beauty and landscape, and the abundant activity. We've been to many dude ranches - this is all time fave! Rainbow Trout was our first ranch we ever visited with our young family. Now, many years later we are looking at returning. We have visited many ranches in CO and WY - all were great in their own way. BUT our favorite and the once we judge all others against is Rainbow Trout. You will not be disappointed. Guaranteed. We've tried several ranches in CO, NT and WY, but keep coming back to RTR. It is simply the best combination of seclusion, scenery, dining, lodging. horseback riding, and above all, the great friendship of the owners. Yahoo. !